I generally like to do at least five reviews a month for SuperPhillip Central. Considering we're already more than halfway through the month, and this is the first review of September, I have my work cut out for me! No worries, though, friends! Maybe it'll be a quality and not quantity type of month. To kick things off, here's a review of a niche Nintendo DS game, Solatorobo: Red the Hunter. Is it a fun game or a dog-gone shame? Finish off the dog days of summer with this canine and cat adventure. The Nintendo DS saw a lot of innovative and interesting games during its lifespan. Heck, some games, albeit very minor, still release for this most popular and bestselling handheld of all time. Japan absolutely adored the Nintendo DS, and it showed with all of the releases by developers and publishers of the region at the time. Namco Bandai was one of many Japanese publishers that put forth a ton of effort to make a killing on the system. 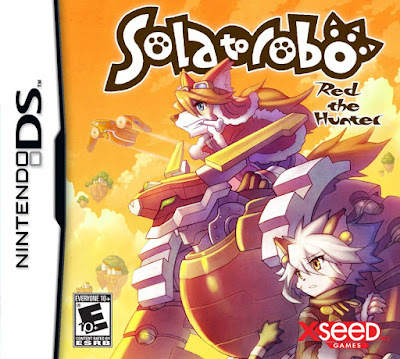 One of the later examples of a niche game that came out for the Nintendo DS, most notably using some Nintendo DSi functionality such as the camera, was Solatorobo: Red the Hunter. What was more crazy-- a dog controlling a mech suit, or dogs and cats living together in peace? While I figure out this question, you can see if Solatorobo is a worthy Nintendo DS title to look into. 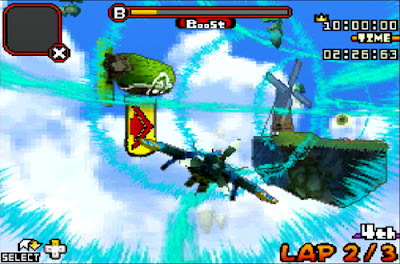 Solatorobo: Red the Hunter is set in a world high above the clouds upon a myriad of floating islands. It's somewhat similar to the Dreamcast's Skies of Arcadia's setting, though instead of human sky pirates, Solatorobo has bipedal, speaking cats and dogs as its population. Red Savarin is an amnesiac canine who has since has made a career out of being a hunter, accepting quests from townspeople from all over the set of islands and doing his best to complete them. Accompanied by Chocolat via electronic communication on missions, she serves as Red's adoptive sister and helps out with giving him information during missions. The settings look marvelous in Solatorobo. The story deals with an armada of cats whose leader is obsessed with power and conquering the world. Typical megalomaniac stuff, sure, but the story remains intriguing from beginning to end. The story throws some curve balls, with the biggest being that the game is probably twice as long as you'd expect. The dialogue itself is quite well written, bringing some humorous moments throughout its 15-20 hour story. 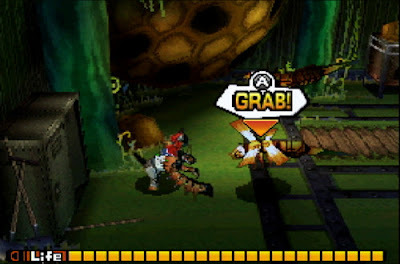 Throughout Solatorobo, Red finds himself reaching a wide variety of island locations. It's here that the story progresses. Every type of mission in the game, whether story or optional, requires Red to accept it at a quest center. Each major island, also serving as a bustling burg, has one of these. Many times you'll have to complete several side quests to earn enough quest points to be able to accept the next story mission .This aspect of the game might be a bit disappointing and frustrating to those players who just want to get through and enjoy the story. Unfortunately, side quests must be taken to advance the story. These are tasks that have some complication to them like rescuing workers from a mine to simpler objectives such as carrying crates from one location to another. Outside of the typical quests, there are some missions and tasks in Solatorobo that use a 3D perspective in them. These quests and activities include races through windy tubes in the sky and miniature island-to-island travel. The former once allowed players worldwide to take on one another via the Nintendo Wi-Fi Connection. This is obviously no longer available to players since the Wi-Fi Connection went offline a while ago, but this game still has more than enough content to justify checking it out regardless. Jet through the sky in these adrenaline-inducing races. Solatorobo plays quite differently than most action-RPGs similar to it. For one, combat is performed while Red is inside his mech, the Dahak, equipped with two long robotic arms. These arms are able to grab and throw objects and enemies. You can chuck one enemy into another to dish out damage to more than one foe at once, but you can also repeatedly chuck, grab in midair, and throw the same enemy more than once to initiate a cool looking and cool feeling combo. Grab, toss, chuck, throw, and lift your way to victory! As the rules of an action-RPG would dictate, and it very much works this way in Solatorobo, as Red defeats enemies, he earns experiences points that when enough have been accumulated, he gains levels, making him stronger in combat as well as upping his maximum health. Red's mech armor can also be upgraded through purchasing parts at various shops with Solatorobo's in-game currency known as "rings", Parts, made up of Tetris-like shapes, can be fit into slots to give Red's mech different abilities like increased health, attack, defense, and decreased time it takes to lift up an enemy in battle. 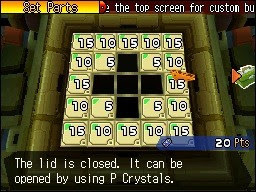 You can gain more slots for Red to utilize by finding "P. Crystals" that are hidden in treasure chests and found in sparkling locations on the ground throughout the areas of Solatorobo. Spend more P. Crystals to create more space to insert more parts. 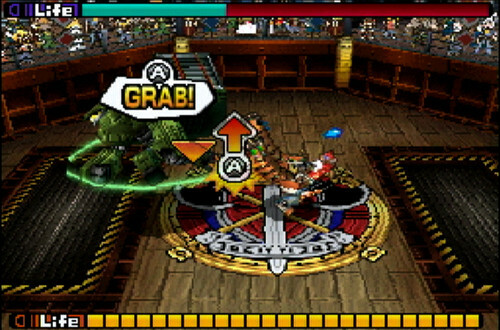 Solatorobo gives you new abilities to unleash on foes as the game progresses. 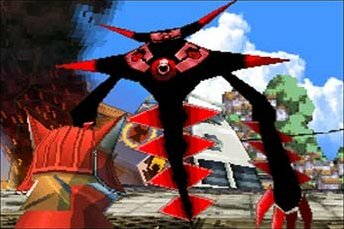 By the end of the game, Red can swing enemies around in a dizzying display, launch projectiles, grab and throw projectiles, and even turn into a powerful being. I won't describe exactly what being this is, as to not spoil things for you guys. This game has plenty to like about it, but there are also some issues. The biggest of which being that while battles feel fun at first, combat can become a bit repetitive, especially with weaker enemies. Boss battles are usually quite entertaining, thankfully. However, all battles, boss or not, are very easy. In general, Solatorobo is a very easy game to complete. The challenge level is not very high. Thus, you might not receive a lot of satisfaction from completing a chapter or beating an important boss fight. Boss fights are the best part of Solatorobo's combat. On many occasions throughout Solatorobo, Red will need to hop out of his mech and leave it behind in order to enter areas that only he can fit through. This allows him to do things that him in his mech couldn't do together, such as scaling ladders, swimming, pulling switches or activating buttons, and shocking foes into immobilization with his patented stun gun. Thus, Red isn't truly defensive while out of his mech, but he can't defeat foes all the same. Solatorobo is a good looking Nintendo DS game all things considered. Obviously as someone who has been playing a lot of Nintendo 3DS games with much more improved graphics, going back to a 3D title on the Nintendo DS, which didn't do 3D the best or with a lot of justice, can be a bit jarring. However, if there is a list of games that look admirable in visual quality on the Nintendo DS, Solatorobo: Red the Hunter is indeed one of them. Sound-wise, the music isn't of the best quality, but the compositions are serviceable enough. I say "serviceable" because I struggle to recall any of the themes from the game, but they are hardly what I'd consider bad. 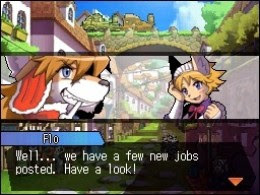 Solatorobo: Red the Hunter is yet another example on the Nintendo DS of a game that defies conventions and offers a rewarding and interesting experience because of it. It's by no means perfect-- forcing the player to go through side quests to continue the story is a bit of pitiful way of adding longevity to the game, combat can become repetitive, and the difficulty could pose a greater challenge to players than it currently does. However, Red the Hunter is a highly competent yet niche Nintendo DS exclusive worthy of a place in most libraries.